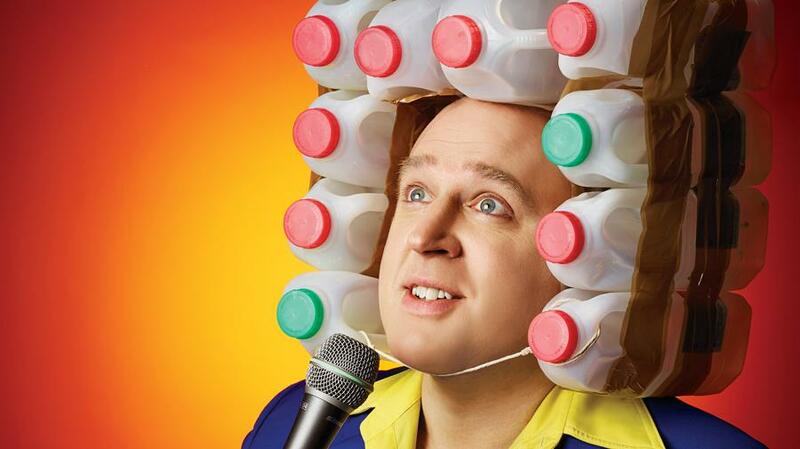 Comedian Tim Vine is the king of the one liners, his jokes are legendary. He has won the best joke award at the Edinburgh Fringe Festival, twice, and he's been the runner up many other times. 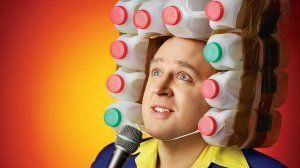 At the time of writing he's currently finishing his largest stand-up tour to date called "Sunset Milk Idiot" and he's also appearing on the current series of the Dave TV Show Taskmaster which see's Greg Davies in the titular role setting silly tasks for a group of comedians. I met up with Tim before a recent show to talk to him about his faith, the nature of comedy and, of course, being on Taskmaster! Well my journey to faith is that I always went to church, it was just a normal part of growing up I was taken to church and Sunday School and stuff when I was very young. So young that I can't remember when I first went. I don't remember the first time when they said "we're now going here." It was just something that I realised that you did every Sunday. Yes they were both very strong Christians and they used to go to this local church, the church that I still go to sometimes most Sunday nights. That put me in good stead really because I've always believed, by and large, what has been said from the front. I mean , you know, one or two questions have arisen in my head, but not enough for me to throw the whole thing out the window. So I still have a faith. I would say when I was 12 I kind of did one of those 'Journey Into Life' commitment prayers on a Pathfinder camp. So it's kind of a steady thing that is always there, you know? You've obviously got a moment when you decided it was for you, a lot of people who go to church they just drift through, they know they believe it. But you've got that moment that was it. Yeah, but if you asked me if I believed it before then, I did. So it's hard to explain. I think this thing about there being a moment, there's an interesting theological discussion to be had, isn't it? I've spoken to someone who says that it doesn't take into consideration that at any given time some people are moving towards God and some people are moving away from God. So that's all theology for another day. It's better than discussing how many angels can dance on the head of a pin! It's that kind of thing, yeah! So, everyone says that it's really hard to make it in comedy. How was it for you when you started out, was it difficult? Do you know what? Part of the reason that it wasn't difficult for me was because I didn't go into it thinking I wanted to make it in comedy, as such. I really, genuinely, found these comedy clubs in London and I found there were loads of them, and I thought that it was great fun going and doing five minute spots there. That just sort of grew naturally into, then I would do ten minute spots and then I got up to doing 20 minute spots and it was like a hobby to get better at stand up really. The fact that it turned into something that I now call my job is something that I feel very blessed about, but it was not my plan, maybe it was God's plan, maybe that's the thing. Well, no, I don't think I ever did have a career, I had jobs. I used to work in an office in Croydon and made some very good friends there who are still mates of mine now, and that was like a pension firm and I was mainly doing VDU input. I always said it was just those three letters over and over again V - D & U. I don't think that I ever had a job that I cared about in terms of my thought life. I'd often do jobs in shops and things and I would dream, a bit like when I was at school, I was there, but in my imagination I was probably thinking about jokes and I was elsewhere. Whereas when I started doing comedy the two things aligned, you know? Yeah, I was constantly, certainly at school I was constantly being told off for just messing about the whole time, yeah! Laughter is a natural human thing, so if you believe that we were created by God then He also invented laughter, and if he invented laughter then he must have thought that there are things to laugh at, so He probably knew there would be jokes as well. So in which case people telling jokes and trying to make people laugh would be something that is God's idea in the first place. I think that's sort of since...I grew up watching stuff on telly that was very...it wasn't really a confessional thing, you were telling jokes. That's more the sort of thing I do, whereas a lot of comics do more chatty style and they are talking the way they talk and some people don't like the fact that some people swear when they talk, but I mean that doesn't bother me particularly. Yeah, I can understand, or I do to a degree. If you want to bring your 12 year old son to something then you don't really want someone f-ing and blinding the whole way through, but it never occurred to me when I was doing all these clubs that I shouldn't be with people who are swearing. I mean the world is full of people who are swearing, I don't think we should judge them for that, I think there should be a higher criteria than what people occasionally say as adjectives. 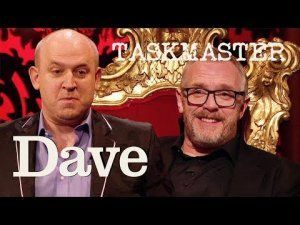 So you are on the current series of Taskmaster which I was quite surprised about. Is it is a struggle to keep your style? No I loved doing that, to me it was just so much fun because I could just mess about. Someone else said to me the other day 'I didn't think that it was your sort of thing' and I said 'how do you mean, I absolutely loved it, it was great fun', and they said 'oh you know it's got a lot of swearing in it!' I didn't say this to them, but at the time I did think to myself 'well look you know, hands up who works somewhere and they've heard someone who works with them swear. What are you supposed to do, leave the job?' It's ludicrous, let's get real about the world we live in, people talk a certain way and that's fine. You could argue that it's far better to show that there's a different way of doing it to be on shows where people are swearing and not swearing. I mean I don't do a lot of panel game type things, probably because I don't think I'm very good at them, but that sort of thing, Taskmaster I just loved it because it just gave me a chance to be silly. Most of it you are filming on your own, you know. In the house? I guess the only time you really see the other comedians is on the stage. Yeah, as I say I am not really desperately hung up on that. When the other people are playing for the crudest laughs going, is it hard then to keep yourself clean? No, I just don't join in with those bits...and that's not because I'm taking some sort of higher ground, but I have a sort of silly persona and I prefer that my stuff stays like that, and if it goes off in one direction I just don't tend to join in with that, I wait until the next bit where I can say something silly. Sometimes that means that you don't say something for a bit, other times you say more things than other people, so it's a mix. Panel games are like that, everyone chips in at different times. The good thing about that show is that they come back to you to show your silly tasks. Did you find it hard when there was something funny, but it was quite vile, but because you are on stage you don't want to show that you are giving appreciation to that. Did you find that an issue? Sometimes I find things that these people are funny. Listen, lets be honest about it, my act doesn't have any swearing in it, but I do find some comics who swear funny. I find most comics funny. Most comics I enjoy, with or without swearing. There's another myth about swearing, that when people are very anti it, that you can swear and that just immediately makes stuff funny and that's not true. If that was the case then everyone would be doing stand-up because it's very easy to swear, but it's not easy to make people laugh and, just because there is a bit of swearing in people's jokes, there is still the craft of the joke there or whatever it is that's intrinsically funny. So I respect anyone who gets up on stage and tries to make people laugh regardless. We all have personal tastes about subject matter etc but it's not such a big deal for me. Because I am not in charge of anyone else's thing. Exactly. If you work in an office then you are not in charge of the people that you work with. I mean if you work for a Christian organisation then it's an easier thing isn't it? If you work in a shop are you supposed to resign if you hear a fellow worker say something rude? You take issue saying "I can't help noticing you keep saying that word, could you stop please?" Have I? I've always felt it was just bumping along in the middle. OK, fair enough. There was a lot of exposure a few years ago with things like Fort Boyard, Whittle and you were on the TV quite a lot, and then you seemed to disappear for a while and now it seems like you've come back. It seems like it, you've been on a lot of things. Have you found any bits of it tough, have you ever been overlooked for something that you would like to do? No, I've never had that. I'm very, very fortunate. The thing that I am most grateful for in relation to my job is the length of time that I have been able to do it. If you look at my career as just being television I guess it's quite hard to judge what's up and down. I'm just grateful to do what I'm doing. In terms of tours, this is the biggest tour I've ever done, and in terms of that it's only ever gone in one direction. At some point obviously these numbers tail off and people stop coming to see me, but I'm very grateful that at the moment I am playing these places. 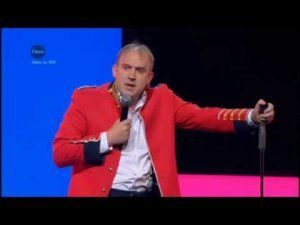 I did Hammersmith Apollo for the first time last week and it was a great experience. So I can't say that I honestly am thinking 'I wish I'd been given that and been given that'. Mainly I'm grateful, I'm getting too old to be thinking about anything else. Exactly! Certainly in relation to my job, it's the one area of my life where I can say I've just been very lucky to be doing what I'm doing. One last thing, you are a Christian, but you tend to keep a lot of it quite private and a lot of your personal life is private. Well, there's not much to tell, that's probably why! Would you ever use the platform that you have got as an evangelistic opportunity, or have you ever used it like that? Well my main job is to make people laugh, so when I get on stage that's my job. Like a bricklayer, his job is to lay bricks, so I go on and the only thing I think about at that point is making people laugh. Now the overall feel, people say what I do has a kind of wholesome feel to it and I'm glad about that because that makes me feel good. None the less I want to know these people out like a boxer, I want to get out there and make them laugh. Bang, bang, bang, bang, bang, laugh, laugh, laugh, laugh, laugh. So, one day maybe I'll be a preacher, but I don't think the two can overlap at exactly the same time. I can't go on stage an occasionally drop in the odd thing about Jesus or something, you've got to be careful what people have paid for. People have paid to be made to laugh and when they come to this theatre tonight I want them to laugh their socks off, you know? I think there's two things, there is a bit of an overlap anyway, laughter is a lovely, pure, healing thing and so yeah I believe it comes from God, not everyone does. To me it feels like I'm doing what God wants me to do anyway, making people laugh, I don't have to go out there and read a couple of pages from Mark's Gospel. Having said that, we all could do more! I would like to preach one day. Coming back to Taskmaster one more time. Have you enjoyed the fact that it has given you the chance to be more than just a one-liner? Yes, very much so. I love being silly and in that situation where they say here's the task and it's something totally daft and you just go for it and I love that It's that side of things that's refreshing, I'm not trying to remember a joke, I loved it, yeah!